YASED Ankara Office, established in November 2013, operates to accelerate the effectiveness of YASED’s activities in Ankara and contribute to the improvement of investment environment by closely monitoring the agenda of GOVERMENT. YASED Ankara Office runs its activities, especially the relations with public institutions and corporations, in order to support and contribute to the legislative process with stakeholders in Ankara, within the aforementioned context. operate our relations and activities with all stakeholders in Ankara, to establish a close dialogue with our members, to plan and implement our Ankara activities. YASED Ankara Platform, operating through coordination of YASED Ankara Representative Ali Naili Tunaboylu, came together with our members’ Ankara employees and corporate relations officers at two meetings in April and September. 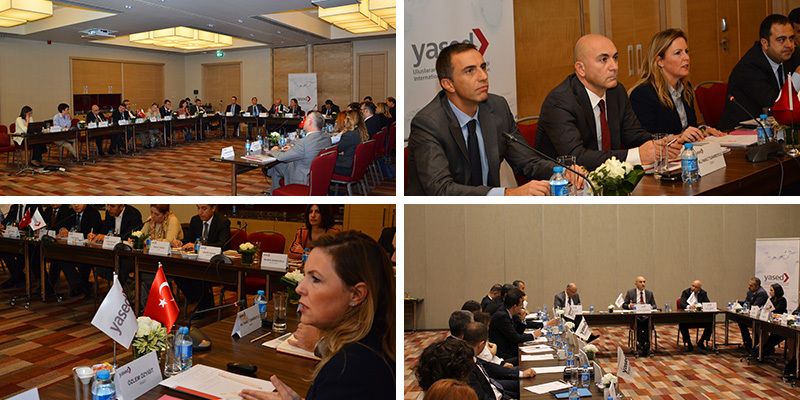 At YASED Ankara Platform meetings, after making a general evaluation regarding Turkey’s and YASED’s current agenda and legislative practices, a thematic topic is discussed through attendance of guest speakers. Developments regarding the determined thematic topic, problems encountered, solution suggestions, public communication and contributions of YASED against these problems are evaluated during meetings. A senior representative from one of our stakeholders in Ankara attended the thematic section as guest speaker.